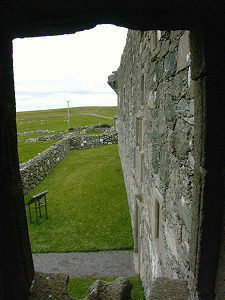 Muness Castle lies in the south east corner of Unst, not far from the rocky headland of Mu Ness. From the ferry terminal at Belmont you follow the main road north west for two miles, then take a right turn for Uyeasound. To get to Muness Castle you follow the road through Uyeasound, from where the castle is well signposted. The grey stone walls of Scotland's most northerly castle blend well with nearby farm buildings, but there is no missing it when you arrive. The key to the castle is available locally: a sign tells you where. What you find are the remaining two-and-a-bit storeys of a three storey z-plan Castle, though the corner towers are circular rather than, as is more usual with such castles, square. 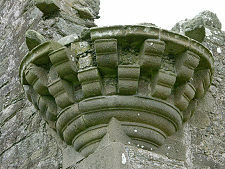 On the remaining two corners of the castle are outcrops of decorative corbelling that would originally have supported turrets at the second floor level. In its heyday Muness Castle would have had a walled courtyard on its south west side, complete with ranges of outhouses probably comprising additional accommodation, a bakehouse, brewery, stables and perhaps a chapel. 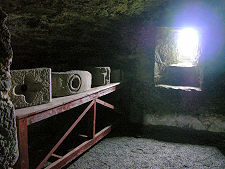 These have long since gone, though their stone is probably still on view in the nearby buildings. 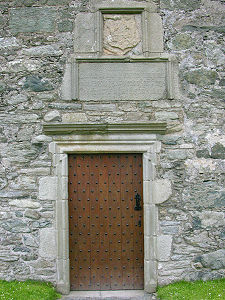 A single well protected door in the south west wall of the castle gives access to the interior. 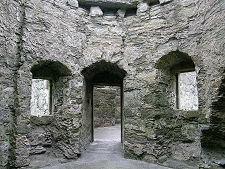 The ground floor comprises a large kitchen and a series of cellars, one of which is now used to display decorative stones and loopholes from the castle. 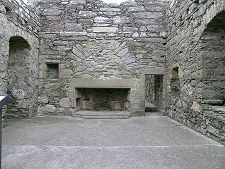 The first floor comprises the main hall of Muness Castle, the centre of social and business life. At either end are chambers. The principal chamber is at the far end from the main stairs. And from here the remains of a private spiral staircase can be seen winding up towards the no longer present second floor. 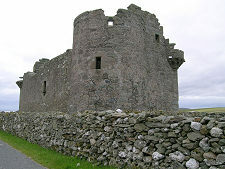 Collectors of castles may notice some resemblances between Muness Castle and Scalloway Castle on Mainland, and even with the Earl's Palace in Kirkwall on Orkney. All were built around the same time, and by the same family. 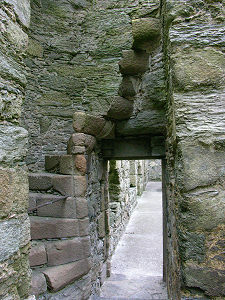 Muness Castle was built by Laurence Bruce, the half brother of Robert Stewart, the Earl of Orkney. Laurence Bruce was appointed Sheriff of Shetland and set to work with a corrupt and cruel enthusiasm that was characteristic of the family. When Robert Stewart was succeeded by his son, Earl Patrick, Laurence Bruce felt threatened by the change. 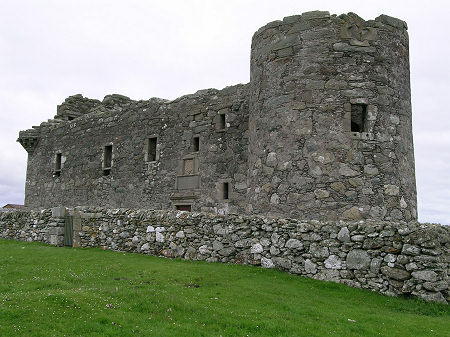 He therefore started building Muness Castle in 1598, even before Patrick Stewart set to work on Scalloway Castle. Both castles were designed by Andrew Crawford. Bruce had good reason to feel concerned for his safety. In 1608 Earl Patrick arrived in Unst with 36 men and artillery, intent on capturing or destroying the castle. And they might well have succeeded had they not suddenly withdrawn for reasons that have never been explained. But it was only a temporary reprieve. In 1627 French raiders attacked and burned Muness Castle. It seems to have been repaired, but was no longer in use by end of the 1600s. In 1713 the castle was rented to the Dutch East India Company to house the salvaged cargo from the Rhynenburgh, which was wrecked nearby. 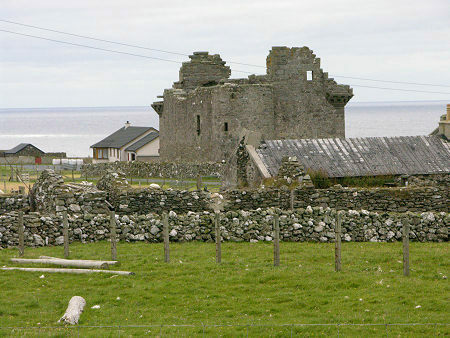 The Bruce family sold Muness Castle in 1718, and by 1750 its new owners had also abandoned it. The castle was roofless by 1774. Key available locally, admission is free.